It seems increasingly likely that Box-Toppers’ league-leading batters will set dubious records in 2018. 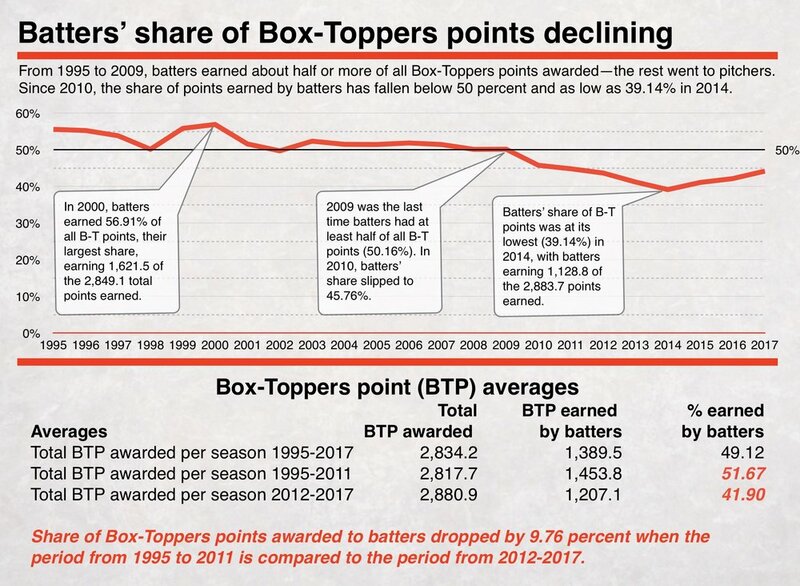 Both the American League and National League leaders among batters in Box-Toppers points currently have point totals that would be the lowest to lead their league’s batters for a season since Box-Toppers tracking began in 1995. Astros pitcher Lance McCullers is Saturday’s Box-Toppers Player of the Day, rising to ninth place in season player rankings. McCullers struck out seven over seven scoreless innings, allowing two hits and no walks, in the 11-0 win over the Athletics. McCullers earns 2.0 Box-Toppers points for being Player of the Day, giving him 4.7 for the season, rising to ninth place in season player rankings, sixth among American League pitchers. With McCullers’ rise, Astros pitchers now make up four of the top 10 spots in Box-Toppers season player rankings. An overview of Box-Toppers' new season-by-season Detail Leaders page. This page includes a sprawling, scrolling chart that shows a listing of the top five or 10 players in different categories and subcategories for each season going back to 1995, the first year of Box-Toppers player tracking. It’s a useful tool for research or to relive who were the top players of past seasons. Dodgers pitcher Hyun-Jin Ryu is Tuesday’s Box-Toppers Player of the Day. Ryu struck out eight over six scoreless innings, allowing one hit and one walk, in the 4-0 win over the Athletics. The 2013-2017 Box-Toppers point total for all players comes from dropping the points they earned in the 2012 season from their 2012-2017 totals. Box-Toppers uses this longer-term total to gauge a players’ staying power over the recent past. 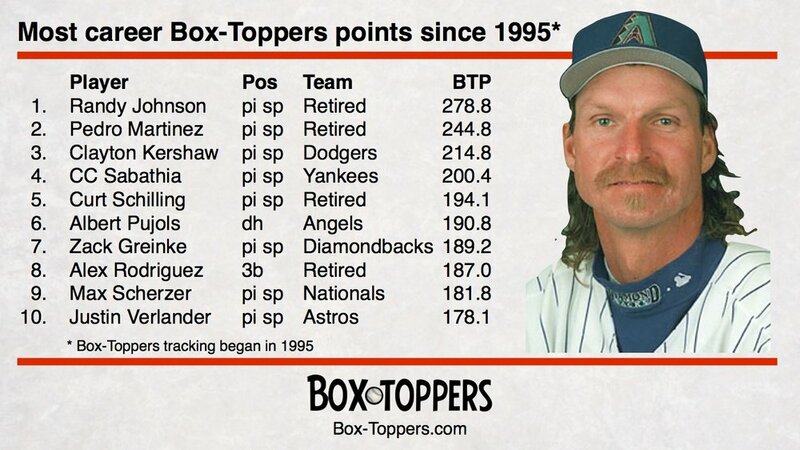 For example, the all-time leader, Randy Johnson leads with 278.8 career Box-Toppers points (earned since 1995, when Box-Toppers tracking began). Johnson also leads in Box-Toppers points among all pitchers since 1995. Chris Sale leads over past season, Max Scherzer leads over past two seasons and Clayton Kershaw leads over past six seasons and also leads all active players in career Box-Toppers points. Manny Ramirez has the most Box-Toppers points of any outfielder since tracking began in 1995. Matt Holliday leads active outfielders in career points. Other leaders include Giancarlo Stanton, Mike Trout, Aaron Judge, Jay Bruce and Andrew McCutchen. Miguel Tejada has the most Box-Toppers points of any shortstop since tracking began in 1995. Derek Jeter ranks a distant second. Other leaders at shorstop include Troy Tulowitzki, Elvis Andrus, Corey Seager and Stephen Drew. Cabrera has 146.9 career Box-Toppers points and in 2017 passed former player and newly elected Hall of Famer Thome, who has 146.7 points. Other leaders at first base include Anthony Rizzo, Edwin Encarnacion and Paul Goldschmidt. Four players—Chipper Jones, Vladimir Guerrero, Jim Thome and Trevor Hoffman—were elected to the National Baseball Hall of Fame Wednesday. Key players overlooked: Curt Schilling, Jeff Kent, Johan Santana and the PED-clouded five of Roger Clemens, Barry Bonds, Manny Ramirez, Gary Sheffield and Sammy Sosa. The Box-Toppers All-Star teams for 2012-17 consist of the best players over the past six seasons, which includes 12 of the 27 players who are also on Box-Toppers 2016-17 All-Star teams. Also, among the 27 players on the teams, there are 11 players who are on Box-Toppers 2017 All-Star teams and 10 who are on All-Star teams over all three time spans—for 2017, for 2016-17 and for 2012-17.Leading the 2012-17 All-Stars is Dodgers pitcher Clayton Kershaw, who ranks first in Box-Toppers points over the past six seasons with 147.2.